Where Do I Install My Acoustical Treatments? Absorption anywhere in the room is useful in reducing reverberation. Reverberation is the enemy of voice intelligibility, which is usually the number one concern in working with business spaces. 3. Surfaces as close to the sound source as practical. 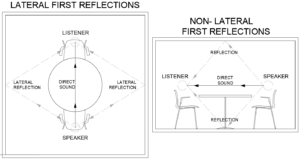 A “First Reflection” is the arrival of sound at its destination after a single reflection from the source. See the illustration below. Reducing first reflections is critically important in enhancing voice intelligibility regardless of the of room reverberation levels. A first reflection arrives ahead of all other reverberant sounds. The reason lateral reflections are so important is that ears are oriented horizontally (on the side of the head). The brain processes differences between left and right sounds to localize and decipher sounds. If we had one ear below the chin and one on the top of head (illustration not included), non-lateral reflections would be the treatment preference. Rule of thumb: Place the treatment in the “Median Plane” which is even with the average height of the ears of those in the room – say about 50″ above the floor.